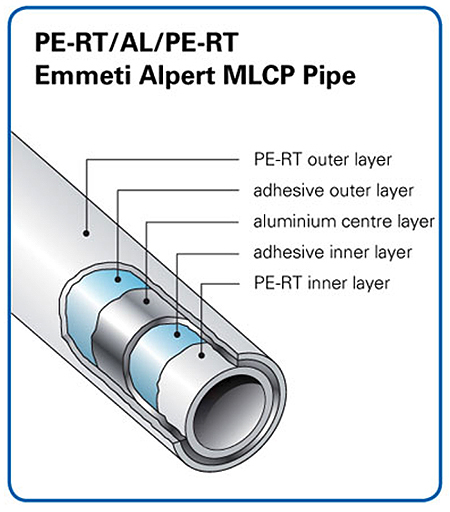 Emmeti Alpert MultiLayer Composite Pipe is commonly used in Underfloor Heating and low temperature Wall Hung Radiator systems because of its flexibility and strength. The pipe can be easily formed and will retain its shape which makes installation of underfloor heating loops extremely simple. 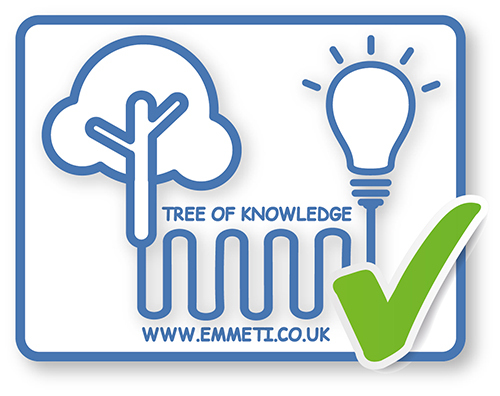 Alpert MLCP –When used with the Emmeti range of sanitary manifolds and monobloccos is a WRAS approved system for use with Hot and Cold water supplies. A range of accessories and fittings are available to aide installation including Monoblocco connectors, pipe preparation tools, tacker guns, pipe clips, castellated panels and bend supports. Adhesive layer – Permanently bonds the outer PE-RT layer to the aluminium core. Aluminium layer – thin layer of aluminium which provides a solid oxygen barrier to prevent corrosion of the heating system components and gives form retention when shaped. Adhesive layer – Permanently bonds the inner PE-RT layer to the aluminium core. Inner layer – Inner layer of clear, smooth PE-RT. Preventing pressure drops from water flow, and preventing deposit accumulation and corrosion. Available in 16mm x 2mm, 100m, 200mm & 500m coils and 20 x 2mm in 100 and 240m coils. What is the difference between PE-RT/AL/PE-RT (Alpert) and Gerpex MLCP? Both Alpert and Gerpex are Multilayer Composite Pipes, Alpert is made up of layers of PE-RT and Aluminium whereas Gerpex is made up of layers of PE-Xb (and PE-HD for sizes over 40mm) and Aluminium. Alpert is designed for UFH and low temperature heating applications due to its maximum operating temperature of 70oC. Gerpex is designed for a wide range of sanitary and heating applications. It’s maximum operating temperature is 95oC.